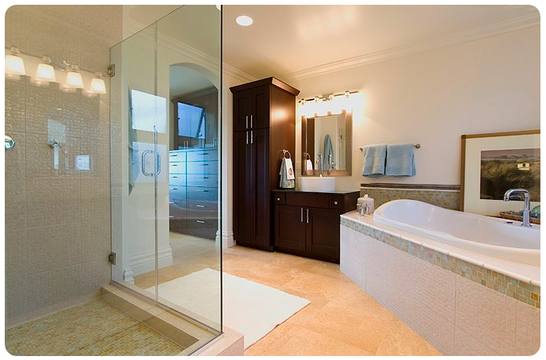 From shower remodeling to custom bathrooms, room additions and more, we are here to assist. Call locally or click below. BKR Pros is a leading residential, industrial and commercial remodeling company with affiliates in Glendale, Mesa and the Phoenix area. We have more than 20 years experience in all phases of remodeling and specialize in custom shower and bathroom renovations. No matter what your needs, we can help. With branches in every major area of the U.S., we are here to assist. Our commercial construction branch can also help with flat roofing and more. Surface materials for shower installs: Any surface material for a tub or shower surround should be applied on top of water-resistant wall material. The most common type we see in Phoenix is water-resistant drywall, sometimes called green-board because of its hospital green color. A more durable and water-resistant product is a cement-board product called Duroc. Our shower remodelers have been using Duroc for years on bathrooms in Phoenix and fully understand the application process. The cement-board products may be more expensive than green-board, but the added expense give you a foundation you know can stand up to the moist environments of the bath and shower area. The surface material itself must be waterproof, not just water-resistant. Various manufacturers offer prefab surrounds made of fiberglass, acrylic, vinyl, plastic laminate and similar materials. Remodelers should avoid buying a one-piece surround unless they choose a unit that can be transported into the bathroom through available openings. Multi-piece surround kits, which can be assembled inside the bathroom, are also available. If you decide to create your own bath or tub surround, you have a choice in contractors in the Phoenix area - look no further than the experts at BKR Pros! Solid-Surface Material: For durable, stylish, easy-to-care-for shower enclosures, solid-surface material is hard to beat. Though sometimes pricey, today's options in this category have a lot to offer. Nothing betas this smooth acrylic surface for ease in cleaning, and the material lasts a lifetime. For do-it-yourselfers, solid-surface tub and shower kits offer easy installation. These kits generally consist of precut panels and curved corner moldings. They are designed to go with standard fixtures; nonstandard installation requires professional help and our contractors are here to assist. Ceramic Tile: Waterproof, durable, and easy to maintain, ceramic tile is a logical choice for tub and shower surrounds. One drawback: The grout can mildew, making it difficult to clean. Small mosaic tiles come bonded to sheets of small fiber mesh. These sheets go up faster than loose tiles, because you don't have to set each piece individually. Pre-grouted sheets of square tiles have flexible synthetic grouting. You stick the sheets to the substrate surface first, then apply a thin bead of caulk around the edges. As with mosaic tile sheets, installing pre-grouted tile sheets is not as time-consuming as laying loose shower tile and does not require as much skill. Fiberglass: Fiberglass is waterproof, durable, and simple to clean. Many companies manufacture three and five piece shower and tub surround units in various sizes. Pricing is reasonable in most cases. No matter what your renovation needs, we are here to help!